It probably should come as no surprise that the diverse community of City Heights delivers up equally diverse coffee drinking experiences. The one unifying quality to the coffee here is a certain “robustness–” this IS City Heights after all. If you love the smell of coffee, the taste of coffee and the experience of drinking coffee in unpretentious cafes and restaurants, City Heights delivers on all counts. I began my week with a hot Vietnamese coffee, pâté chaud and sharing a Vietnamese Special sandwich with my husband at Café Doré, so hot Vietnamese coffee with espresso and condensed milk it is for this week’s coffee column. The cafe is located in a strip mall off of University Avenue that includes a busy laundromat, a couple of Asian markets and a check cashing store. There is always a lot of activity outside the doorways too and along the long connecting sidewalk. The area doesn’t exude prosperity in the generic way we are too often accustomed to expect, but there is a richness there that generic simply can’t engender. We’ve been going to Café Doré for decades and I had brought a list of questions pertinent to writing this column. I realized after posing my first question that the waiter, who has been there for years, doesn’t speak English any better than I speak Vietnamese. This affable man and I participate in that time honored tradition of Universal Eating, which is to say that we begin with smiles and hello’s and I go right to pointing to a number on the menu. I say the English translation, he nods and repeats in Vietnamese. It has worked splendidly. But I cannot tell you why he did not serve the hot coffee the usual way with the little metal coffee filter sitting just perfectly on the top of a thick walled squat glass, dripping its dark aromatic contents upon the sweetened condensed milk at the bottom. Nor can I tell you anything about the board game that men often sit outside the door and play. The waiter and I could only smile at each other over a linguistic chasm. That happens here in City Heights. This video that I found on Boingboing shows the art of making hot Vietnamese coffee, and for good measure it adds a snappy Thai tune that will make you happy. What we eat and drink is often inextricably entwined with the history of whole peoples, even whole countries. Coffee ranks right up there with tea, salt, cod and sugar as a geo-political game changer. Large scale coffee cultivation in Vietnam was a result of French and Dutch colonialism in the 18th and 19th centuries. By the late 1800’s, the French had established a thriving coffee industry in several locations of the Annam Region, a mountainous plateau that extends through several countries. Only Brazil produces more coffee today than Vietnam. The condensed milk that is traditionally used had me curious. How traditional can condensed milk be? It turns out that Vietnam wasn’t much of a dairy drinking culture, so fresh milk was difficult to find and it didn’t hold up in the heat. Technological innovation, which is often a significant part of the story about food, solved the milk problem. In 1856, inventor Gail Borden patented condensed milk on the other side of the world, in New York. By the 1920’s there were flourishing French cafes in Vietnam and the Vietnamese likewise embraced this hot sweet beverage. 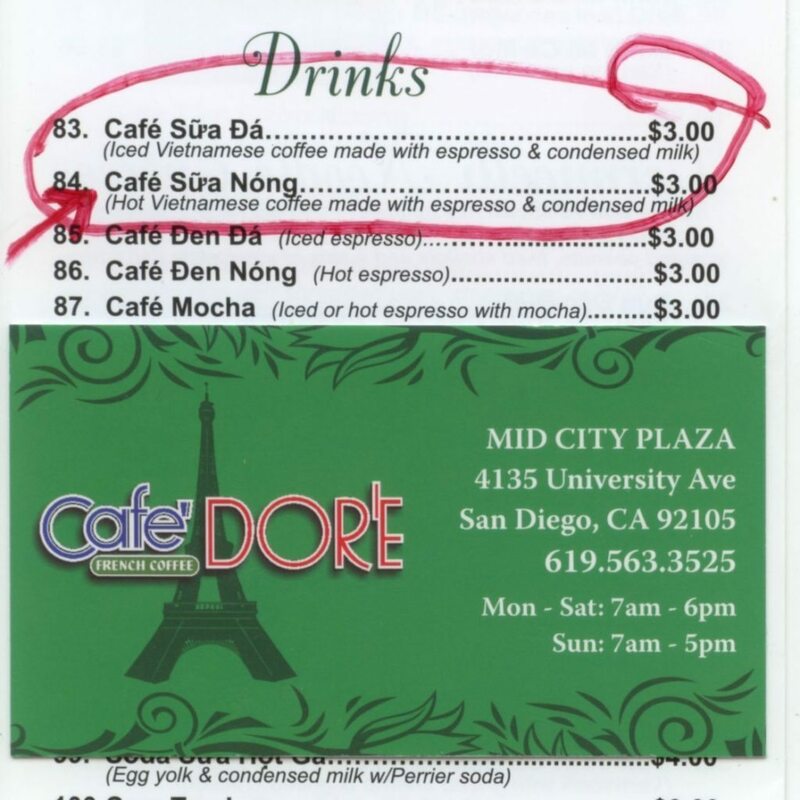 Despite the language issue, sipping a hot Vietnamese coffee in Café Doré feels natural, even familiar. Maybe it’s the green formica table tops and the green linoleum floor, or something about the animated conversations and smells. It is sometimes reassuring for me to know how differently people can approach possibilities and challenges. Take the possibilities of pork for instance. Americans came up with Spam while the French and Vietnamese came up with pâté chaud. The truth is that when I leave the cafe I return to the larger prevalent culture, with a language, traditions and mores that I understand. That is also reassuring, perhaps more than I would like to admit. My immigrant neighbors, particularly recent immigrant neighbors, look to family and their churches, temples and mosques to help fix them in this new, different place. The ethnic cafes and restaurants in City Heights present social spaces outside of that more circumscribed familial realm. They are often one of the few vestiges of how “home” felt, smelled, tasted and sounded. I cannot imagine how it feels to never be able to go home again. I enter Café Doré with a viva la différence attitude. I am sure the Vietnamese waiter there feels something quite different. And here’s the thing–our unique cafes and restaurants function as places where both of these attitudes can exist side by side. That makes them precious and vital to our life together here in City Heights. In the upcoming weeks I will write about the Mexican café de la olla at El Borrego restaurant and about women drinking Ethiopian coffee. Where are your favorite places for coffee City Heights style? This Saturday, June 23, come out and enjoy a Taste of Little Saigon, which showcases the many businesses in the newly established Little Saigon District on El Cajon Blvd in City Heights. « The Starting Line — Demonstrations, Caravans and Twitterstorms, Oh My! I love the espresso at cafe Dore. Transports me to Havana or Paris or Venice depending. I really loved this cafe in the early days when they still had teh French sound tracks (which someone stole). They are situated in a commercial mall (City heights style-filled with cars) next to the laundromat and the fresh fish market but in the day it was a junk yard for cars and Ton Hom and his wife Dorothy escaped downtown redevelopment and bought the junk yard and built a community space. they put a Little plaque on the entryway that honored the community effort to renew and reinvigorate itself. Nice little moment that few people notice but after an espresso at Cafe dore thigns sem always a bit brighter. Well thanks for the Vietnamese coffee tip, Anna, I may have to check this place out if I’m ever in the area and have time to sit for a drink. My impression of Vietnamese coffee houses has been a bit more…well…from what I’ve heard I’d feel rather awkward frequenting the ones I’ve seen reviewed on Yelp. Dave- skip Yelp and check out Cafe Dore. Call me and I’ll meet you there. Actually the Yelp reviews are overwhelmingly favorable. I’ll check it out one of these days. We still need to do the Tower. Jim, I had no idea about Tom and Dorothy Hom’s connection to this place. What a revelation. I still remember sitting in Cafe Dore one day, the only woman in the place, listening to the plaintive theme song Beautiful Maria of My Soul from the Mambo Kings Play Songs of Love. 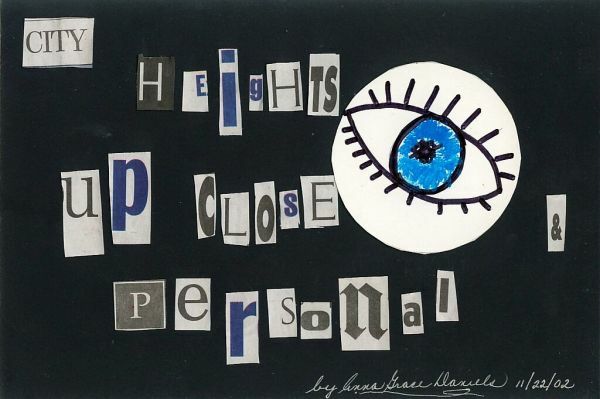 It was the quintessential City Heights experience- I was an Eastern European kid who had grown up in the shadow of the Clairton PA steel mills, listening to a love song from the homesick lovelorn souls of two Cuban emigre brothers in a French/Vietnamese restaurant in City Heights. That pretty much says it all. Gad Anna. After reading your article I might have to start drinking coffee! Could smell the aroma while reading. Awesome article! I’ve been a City Heights resident for 16 years, but never been to that cafe. I will be sure to make a pilgrimage now! Thanks for informing us, Anna, of these out of the way places that we wouldn’t know about otherwise. We’re always looking for places that aren’t franchises that you can find in every shopping mall in every city. Good on you!